Here in Florida, the state government regulates car insurance companies like Progressive, State Farm, Allstate, and GEICO through the Florida Office of Insurance Regulation. Any company that offers a policy providing insurance coverage for any kind of motorized vehicles for loss or damage, liability or expense, must abide by federal laws as well as state statutes and the rules and regulations that the Florida regulatory agency enacts. There’s a reason that these insurance companies are so heavily regulated and closely monitored. Insurance carriers are for-profit companies with the goal of making as much money as they can. 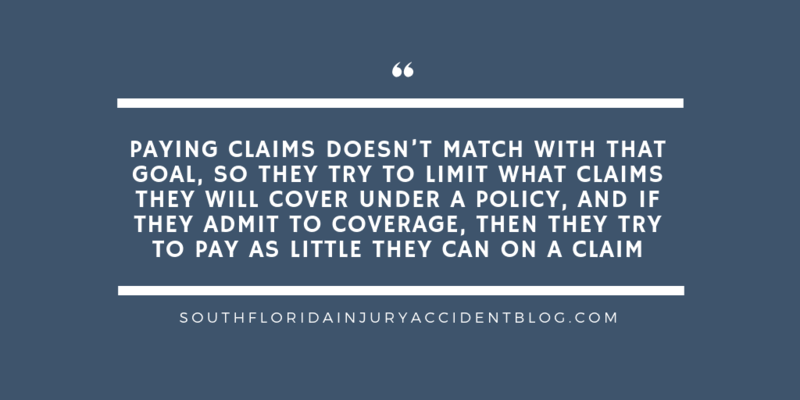 Paying claims doesn’t match with that goal, so they try to limit what claims they will cover under a policy, and if they admit to coverage, then they try to pay as little they can on a claim. Just because you weren’t wearing your seat belt at the time of the car crash or you were in violation of state driving laws, like driving while texting, does not mean that the insurance company is not contractually responsible for paying your claim. If you have a pre-existing injury or medical condition, then that will be a factor to consider when evaluating your injury claim. Then again, it may not. Medical experts will need to provide an opinion here. When someone has been hurt in an accident, the first thing they face is medical care and immediate family needs like how to pay the monthly bills: it’s not rushing out to do claim paperwork. If a family delays filing a claim, then their only worry is if they miss the “statute of limitations” for filing a lawsuit based upon the accident. It’s not whether the company has “closed the file” internally. That’s silly and just a maneuver to get you to go away. Stuff like this is what gives insurance companies such a bad reputation. Never take an insurance company’s idea of who is to blame for a traffic accident: odds are high it’s never going to be caused by something that makes them responsible for paying a claim. Get an independent analysis of what happened to cause the crash. An injury lawyer can help here. It’s smart and prudent to call the police and get a police report after an accident. We highly recommend it. However, if you fail to do so, then it doesn’t mean you have terminated your right to have your claim covered by the insurance company. The insurance company may have their own internal medical expert review the file and give an opinion that your claimed injuries aren’t real. That opinion isn’t the final say. You can have your own medical records as well as your own experts confirm and justify that your injuries are real and your care and treatment was necessary and reasonable. Insurance companies may insult you by claiming that you are faking pain, lying about your suffering, or otherwise exaggerating your injuries in order to get more money from them. They’re all about the money, right? Here, doctors and other medical experts can refute their position. After an accident, people who are truly injured and hurt may be in such an excited state that the extent of their injuries (particularly to the back and neck and internal organs) may not reveal themselves fully for several days. Slow internal bleeding for instance can be life-threatening and invisible right after an accident. If the police didn’t see you hurting or comatose, it doesn’t mean that you are not injured. Claims need to be supported by witness statements and documentary evidence. However, just because the insurance company has not collected this stuff doesn’t mean it’s not available to them. A good injury lawyer will have done their own investigation and will be happy to prove up the injury claim for the insurance company — or a jury, if need be. The insurance company is a contract. They will try and find language in the contract that excludes them from having to pay your claim. For instance, if your college-age son was driving the car at the time of the accident, they may try and argue he’s not a driver that is covered on your policy. Read the boilerplate and get your own legal opinion on what that contract covers under its language and Florida law. Yes Exactly . Due to these reasons companies are not pay car accident claims. You gave very fine points. Thanks for sharing. Actually , When you are making a claim through your insurance after a car accident, you may be counting on the money coming in from that claim in order to pay your medical bills and other costs. Every situation is different. Thanks for sharing.